Well to profit from this morning's long side trade on the S&P 500 you had to be really nimble - the profit was only there for about 4 hours. 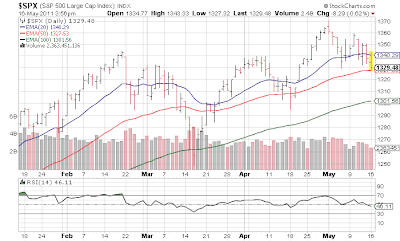 By end of day we have come down to test that 50 day moving average, and broke on an intraday basis the low from 2 weeks ago although some buying in the closing minutes looks like it will keep the index over that low on a closing basis. (the close always more important than the intraday action) With that said, it really seems quite sickly out there and even those frightened by the non stop V shaped bounces might have a hope of a real move down. 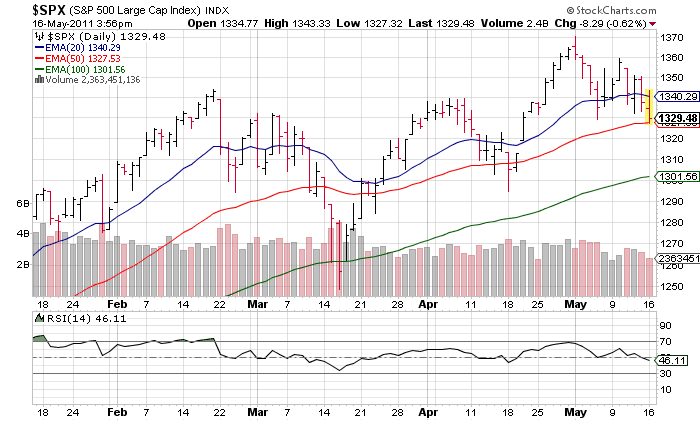 If that 50 day breaks, there is an enticing gap in the 1310s.... then as we said last week, the 100 day moving average at 1300. Worrisome for bulls - today's action despite the dollar being sold off. It almost feels like everyone went margin all in on silver, and once that trade reversed two weeks ago margin calls came across the board and like August 2007 you have a lot of dislocations under the surface in momentum names across the board. This is what happens when every HAL9000 essentially runs the same programs.